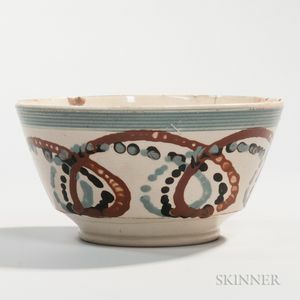 Pearlware "London Shape" Bowl, England, c. 1820, with unusual looping tricolor trails related to the earthworm pattern and with slip-covered reeded rim band, (imperfections), ht. 3 3/4, dia. 7 3/8 in. Rim chips, hairling crack extending into the body from the rim, crack around the circumference of the base.